Deutsche Bank, the 15th-largest bank in the world, oversees $1.6 trillion in total assets, operates offices in 58 countries, and employs more than 91,000 employees. And, of course, that means a lot of Deutsche Bank career opportunities for MBA students and graduates. Given its stellar reputation for international investment and strong position in the global financial market, Deutsche Bank has long been a desirable destination for MBA graduates. Although Deutsche Bank has not always been in the news for the most honorable reasons, right now is actually an excellent time for MBAs to join the company. One of the major appeals of Deutsche Bank is its international cachet. Employees find opportunities to work at its various offices around the world and the company does a lot to help employees take advantage of these opportunities. For MBAs interested in gaining a better understanding of the global finance market, this is extremely appealing. Unlike other companies, Deutsche Bank has started to put a lot of emphasis on building up its young talent base. In 2018, the company brought in almost 800 graduates—25 percent more than they had in the previous year. MBA graduates move directly into the Associate Programme at the company, which provides in-house training and gives them immediate working experience. 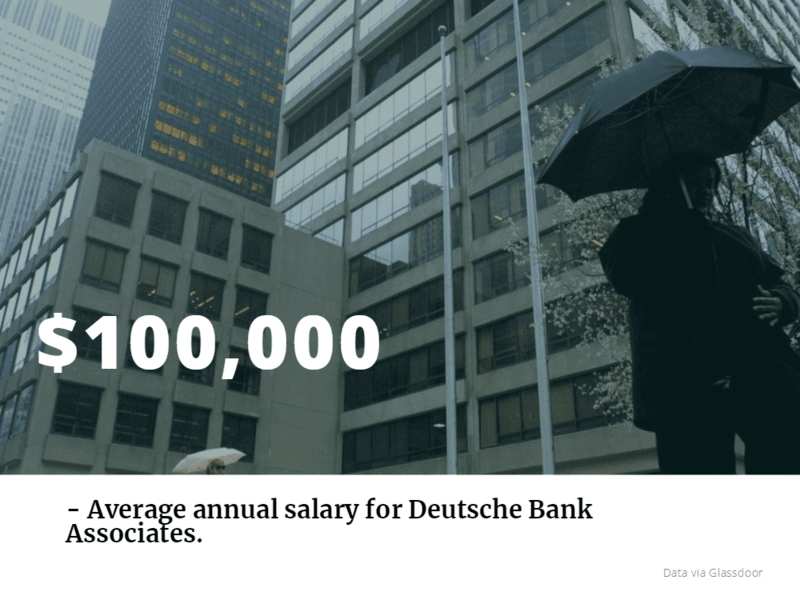 In addition to the firm’s global reputation and its interest in training young leaders, Deutsche Bank provides extremely competitive salaries. According to Glassdoor, the average starting salary for Associates is $100,000, with another $10,000 in bonuses. In addition to the salary, the company offers excellent benefits. There is the standard array of health, dental, and vision benefits. In addition, employees have unlimited sick time, flex scheduling, and a competitive retirement plan. Deutsche Bank also provides generous parental leave—yes, parental leave. New mothers and fathers can take up to 16 weeks off to take care of their newborn. Mothers can take an additional two weeks prior to their due date. Many employees, past and present, speak highly of the company’s environment. They found it to be relaxed and respectful. Others talked about the high quality of benefits offered by the company. Employees also believe that the company allows them to maintain a better work-life balance than they could at other firms. Deutsche Bank is focused on finding people who fit into its culture. One easy way to learn more about the DB culture is via the Associate Intern Programme. Deutsche Bank gives offers to about 80 percent of interns who go through this program. For those who do not go through the internship program, the interview process at Deutsche Bank is fairly straightforward. As the firm itself notes, they are more interested in your interest in the field and in Deutsche Bank. The firm emphasizes the importance of learning about the company before the interview. Deutsche Bank and past interviewees note that interviewees should talk with people who have previously worked at the firm. These people can provide extra information that can help individuals decide whether Deutsche Bank is the right place for them.